If you try to compare records between SmartView and SmartList and they do not match, it’s possible it is because there are more records being returned than what is set in the Maximum Records settings. 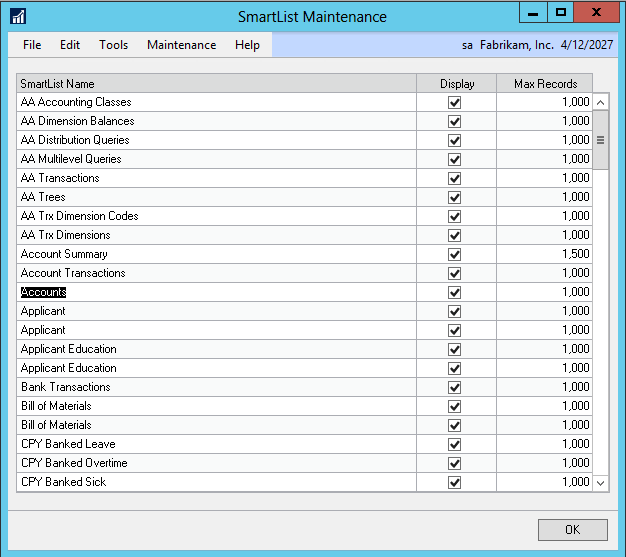 The Microsoft Dynamics GP SmartList default is 1000 records. The SmartView and SmartList queries are a little different and may not return the data in the same order, so while the records returned are correct, what is displayed due to the record limitation can vary between the two. The Maximum Records setting can be changed to accommodate a larger number of records. To make the change in SmartList, navigate to Microsoft Dynamics GP > Tools > Setup > System > SmartList Options. In the SmartList Options window you can choose the Category and View (the Default Go To dropdown list) where the Maximum Records change will be effective. Then, change the Maximum Records field to the desired number of records to be returned. NOTE: Please use caution when changing the maximum SmartList Records as this may affect performance waiting for Dynamics GP to display the data. SmartView has a similar window which can be accessed by navigating to Microsoft Dynamics GP > Tools > SmartView > SmartList Maintenance. 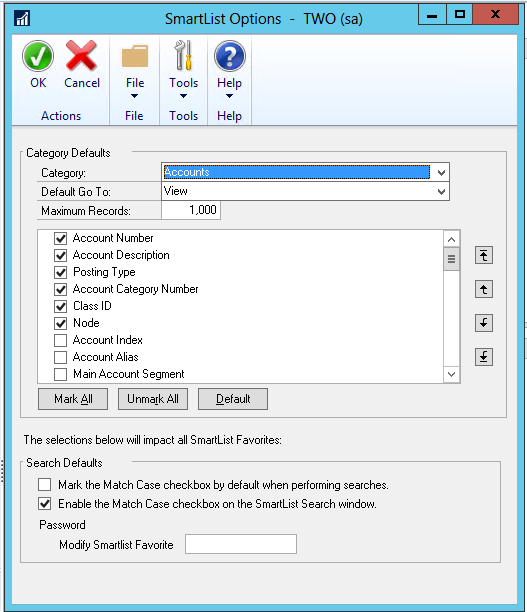 In the SmartList Maintenance window, all the available SmartViews are listed along with the Max Records for each. Simply change the Max Records field to the desired number of records to be returned. Now, if the number of records returned is 1,497, for example, and the Max Records for the respective SmartViews and SmartList have been changed to return a number greater than or equal to 1,497, you should see all matching records when comparing between SmartList and SmartView. The two values are not kept in sync, which would mean the values should be changed in both places each time. Have further questions? Shoot me an email at marty.weets@eonesolutions.com.